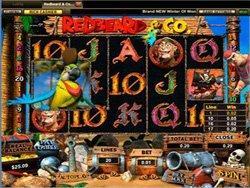 Read our Redbeard & Co Slot review and see screenshots of Redbeard & Co which is a TopGame 3D Slot. Brand New 3D Slot from TopGame! This amazing new 3D Slot is a game powered by the Top Game platform with unique, high quality graphics and interesting symbols. This pirate themed slots game features the wild and scatter symbols along with the Free Spins and Bonus features. Rebeard&Co 3D slots game has 5 reels and 20 paylines and it promises to provide a completely new gaming experience due to its vibrant aspect. The minimum bet per payline is $0,01 and the maximum bet is $5,00. All symbols pay from left to right, except for the SCATTERED symbols, which pay in any position. Only the highest win is paid on each active payline. The wild symbol substitutes for all other symbols except for the scattered and bonus ones. You’ll get the free spins with three or more SCATTER symbols anywhere on the reels. The “Pirate Roulette” bonus can be activated with three or more bonus symbols on an active payline. Start playing by choosing one pirate that should catch the bomb. . If the pirate receiving the bomb has a value other than 0, the bomb will explode in his hands. If the value is 0, the pirate will throw the bomb back to the player and the game will be over. The player can take maximum 2 exploding bombs and the player must keep on throwing the bomb until the game is over. “The cook” bonus will be triggered with 5 or more winning lines. “The Parrot” will be triggered with 3 or more winning lines. “The lizard” loops every 20-40 seconds and the trigger time is varies between 20 and 40 seconds. Gather 3 scatter symbols and you’ll earn 13 free spins! Start playing now RedBeard & Co. and enter the thrilling world of pirates!